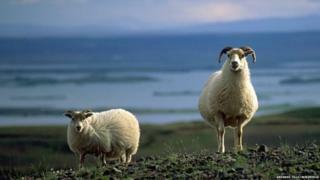 Farmers in Iceland are baffled by the unexplained deaths of thousands of the country's sheep. About 5,000 sheep died this spring, with the northern and western regions worst affected, and so far experts haven't been able to work out why, Morgunbladid's Iceland Monitor website reports. One theory is that sulphur emitted during a recent volcanic eruption might be to blame, as it could have contaminated vegetation and caused malnutrition in the sheep. The huge eruption at the Holuhraun lava field lasted for six months, and released millions of tonnes of sulphur dioxide into the atmosphere. "When the ash cloud moves over the country from the east, it is often accompanied by rain," Prof Jonas Eliasson, from the University of Iceland, tells the site. "The rain cleans the sulphur out of the air and snow does the job even better. When the snow melts in the spring, the sulphur remains on vegetation and in the soil." Many ewes died after the lambing season, and farmers reported signs of malnourishment in their animals even though they were eating properly, Iceland Magazine reported in June. In the most extreme cases, farms lost up to 30% of their flock. There have been other theories surrounding what might have caused the deaths, including disease, cold weather and poor-quality hay. Blood samples from the sheep have been sent to Norway for testing, with the results expected around the end of July, according to the Icelandic Food and Veterinary Authority.